John's ancestors came from Scotland to the Maxville area  and he later settled in Riceville. Like many of the young Scots, he farmed in the summers and travelled to the lumber camps for the winters. His winter location was in Lost River in Argenteuil, a Scottish settlement with many connections to Glengarry County. We plan on making a day trip to Lost River this summer, following the directions in the above text from 1896. 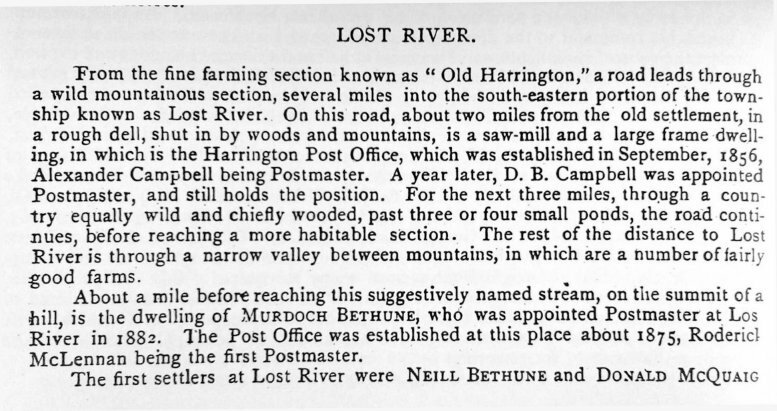 Pioneer names in Lost River include Harrington, Alexander Campbell, Bethune, McLennan, and McQuaig. There was also a Bethune family there, locally called BEATON.